Between Blogger, Twitter and Facebook, I have been lucky enough to interact with many of you readers out there. The reason I started this blog was to share some of these odd and poignant pieces with the world. So far, so good. I'm happy to report that I've learned a little bit about all of you. I will admit that I click through many of your profiles just to see who's out there. What have I learned? You are all book lovers. You know I dig that. Crafters as well. As a DIYer and part-time knitter myself, I really enjoy seeing what you all are up to. Martini decided to knit the extraordinarily complicated Alice Starmore Fair Isle sweater pattern, known as Mary Tudor, and now chronicles her 12 months’ experience. Shades of Julie and Julia? 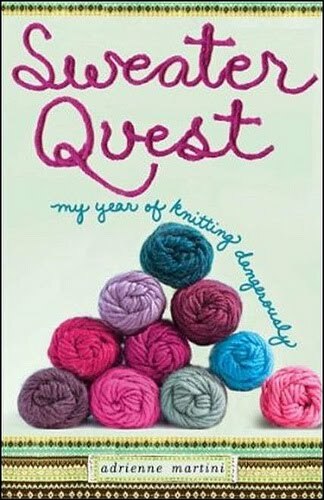 Well, yes, but Martini offers a deeper, more reflective narrative, one that showcases her interactions with other well-known stitchers; her book features family snippets and personal philosophies and her travels to places where knitters congregate, such as Toronto and Rhinebeck, New York. Come on readers, this is right up your alley. Doesn't this sound like an awesome book? Do yourself a favor and pick up a copy. If you need more convincing, check out her website, http://www.martinimade.com/, or look her up on Twitter. I'm not a knitter but why not promote it as a great Mother's Day gift too! I'm sure many of our mothers and grandmothers are knitters. You have me in stitches with this one, but I'm seriously considering it as a Mother's Day gift for the mother in the household who just happens to knit. passing this link on to a couple of my knitter friends. I think they would love it! Never said I was a good knitter. Oh, dear! Does crochet count? Inspired by my daughter and two nieces, I just picked up a hook after 30 years! I'll recommend it to my knitting club at the pub. Ooh... this looks like a GREAT book! And I'm so glad I found your site today... I am loving every entry!